Balladeer’s Blog’s 9th Annual Christmas Carol-A-Thon continues with this song from the 1970 musical Scrooge. Balladeer’s Blog’s 9th Annual Christmas Carol-A-Thon continues! ORIGINAL BROADCAST DATE: December 14th, 1985 to the best that can be determined. SERIAL: Before showing and mocking the movie our members of the Film Vault Corps showed and mocked a chapter of Flash Gordon Conquers the Universe (1940). In that serial Ming the Merciless unleashes a disease called the Purple Death on Earth, prompting Flash Gordon, Dale Arden and Dr Zarkov to fly to the planet Mongo to find a cure and defeat Ming for good. HOST SEGMENTS: None have been unearthed for this episode yet. As always if any other fans of this show have any info they would like to share feel free to contact me – see my About page for details. MERRY CHRISTMAS! Christmas Carol-A-Thon 2017 comes to a close with this eeriest of all the versions to date! A CHRISTMAS CAROL (2012) – This adaptation of A Christmas Carol was a noble effort to try something different that was not just a gimmick. Ignore the negative IMDb reviews which accuse this adaptation of using “Elizabethan language.” They’re off by a few hundred years, since in reality the dialogue follows that in the Dickens novel of 1843. This 2012 version of A Christmas Carol boasts absolutely beautiful cinematography. Its emphasis is on the eerie nature of the story and has the look of a horror film much of the time. It has assorted flaws which I’ll cover as we go along but I almost hate having to cover the negative aspects of such a brave experiment. Balladeer’s Blog’s Eighth Annual Christmas Carol-A-Thon continues! SCROOGE (1935) – This is the notoriously cheapjack and rushed version of A Christmas Carol. Before you know it Christmas Carol-A-Thon 2017 will be over so let’s cram in as much as we can before the 25th. Here’s another individual song from one of the many versions of A Christmas Carol that I’ve reviewed over the years. From Scrooge (1970) it’s Thank You Very Much, which SHOULD have been sung by Bob Cratchit but instead goes to the guy from the Schizoid Man episode of The Prisoner. Christmas Carol-A-Thon 2016 continues here at Balladeer’s Blog with a look at the 1970 musical version that starred Albert Finney. 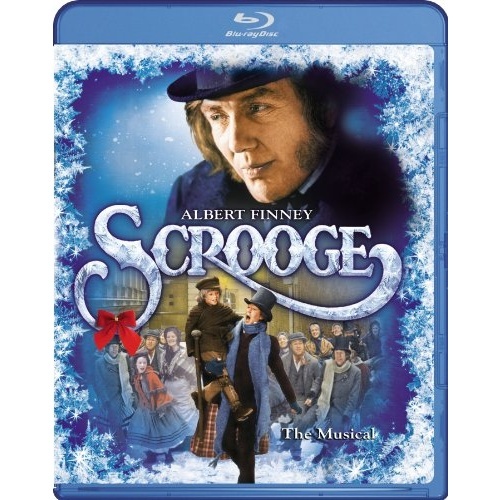 The only – and dubious – advantage to having such a young man portraying Ebenezer Scrooge is that he could realistically play Scrooge’s younger self in the Christmas Past scenes. Big deal. In reality it meant that the portions with Belle get dragged out even longer and more excruciatingly than they usually do, just to take advantage of the fact that for once it’s not a different actor playing the younger Ebenezer. Again – big deal. THE STINGIEST MAN IN TOWN (1953) – For several years only the soundtrack for this terrific musical was available because the bulk of the video from this television production was missing. As of a few years back all the video has been restored so this Christmas season treasure can finally be enjoyed in its entirety. Most people are only familiar with the 1978 Rankin-Bass Cartoon version of The Stingiest Man in Town, which chops the story down and omits or shortens a few songs. Here in all its glory is the original live 1953 production from December 23rd, rebroadcast in 1956, hence the 1956 date on some copies. Basil Rathbone stars as Scrooge, Johnny Desmond plays Nephew Fred, Martyn Green plays Bob Cratchit and Vic Damone appears as the young Ebenezer Scrooge at Fezziwig’s party.